SEFS Scholarship Application–Apply by April 30th! Happy Friday of the first week of Spring 2019! ESRM students, a quick reminder to apply for our SEFS Undergraduate Scholarships by April 30th. The application form, criteria and eligibility, are found on our Scholarships and Awards page. BSE students—a reminder that you have your own scholarship program through WPPF, and you are not eligible for the SEFS funds through this process. Comments Off on SEFS Scholarship Application–Apply by April 30th! Reminder: Be The Match: It’s as easy as 1-2-3! Be The Match: It’s as easy as 1-2-3! There are still a few spots available for this exciting event! Learn how you can help save a life! Register today. 1. HEAR THE STORIES: Hear UW Professor Alexis Harrisshare her struggle to find a match, Joe Grojean’s story as a stem cell recipient, and donor Landon Bennett’s incredible experience as a stem cell donor! 2. VOLUNTEER FOR CHILDREN: Create a note of encouragement for children battling life-threatening illnesses at Seattle Children’s and sign the poster for their unit. 3. YOU COULD BE THE MATCH: You could be the match! Are you between the ages of 18 and 44? You can register with the Be The Match registry or share the registry with coworkers, friends and family and save a life! REGISTER TODAY! Co-hosted by the UW Combined Fund Driveand The Whole U. Comments Off on Reminder: Be The Match: It’s as easy as 1-2-3! Thursday, April 18, 2019, 6:00-8:00 p.m.
We need JUDGES! No experience necessary! We can’t have too many! This is your chance to jump in and be involved if you’ve been looking for a way to do a volunteer job. Training begins at 5:30 p.m. on 4/18. High School students can get community service hours if they come set up, judge, or clean up. Please email Becca if you are willing to judge. The Technology Student Association will have dinner for sale. Questions or want to sign up to help judge? Send Becca an email! University of Washington students serve and lead in on-and off-campus communities to expand their boundaries, to learn from others, and to make a tangible difference in the world. We invite ALL UW students, undergraduate and graduate, from all three campuses, to share how they have worked together to transform their campus and communities, to develop compassionate leadership skills, and to learn from each other. Join us to share how you live We>Me! Apply today to showcase the ways you are involved in service, leadership and activism in the 26thannual Spring Celebration Gallery of Student Posters which will be held on Tuesday, May 21 from 2:00-6:00 p.m. in the Husky Union Building (HUB). As part of the Gallery, you are invited to present your engagement through a poster display and discuss your service and leadership experiences with other students, faculty, community partners, civic and University leaders. – Expand your resume to include a new public presentation experience! All applications to participate are due by April 11, 2019. Questions? Contact the Spring Celebration of Service and Leadership Committee at sprcele@uw.edu. French & Italian Studies Courses Still Available! French & Italian Studies still has seats available in several excellent courses taught in English with no prerequisites. Good opportunity if you are looking to earn DIV, VLPA, or I&S credit. Students can attend class and get an add code from the instructor to register. See the course flyers attached. French fairy tales as a major trend in French literature and a continuing influence on modern fictions and films. Particular attention given to the numerous French women writers of fairy tales at the time of Charles Perrault (seventeenth century) and after. In English. Introduction to Italian culture focusing on fashion and manners from the late Middle Ages to today. Explores common assumptions about nation, gender, clothes, make-up, and manners, through literary and visual analysis. In English. Offered: jointly with ART H 260/JSIS A 260; W.
Shifting Italian and European definitions of race and otherness in literary and visual representations from 1300-1700, ranging from medieval stories about Jews to 17th-century paintings. Topics include religion as race; language and nationalism; travel literature, costume history, and ethnography; and the presence of “black” Africans across Renaissance Europe. Taught in English. Comments Off on French & Italian Studies Courses Still Available! Each year thousands of workers are killed and millions more injured or diseased because of their jobs. 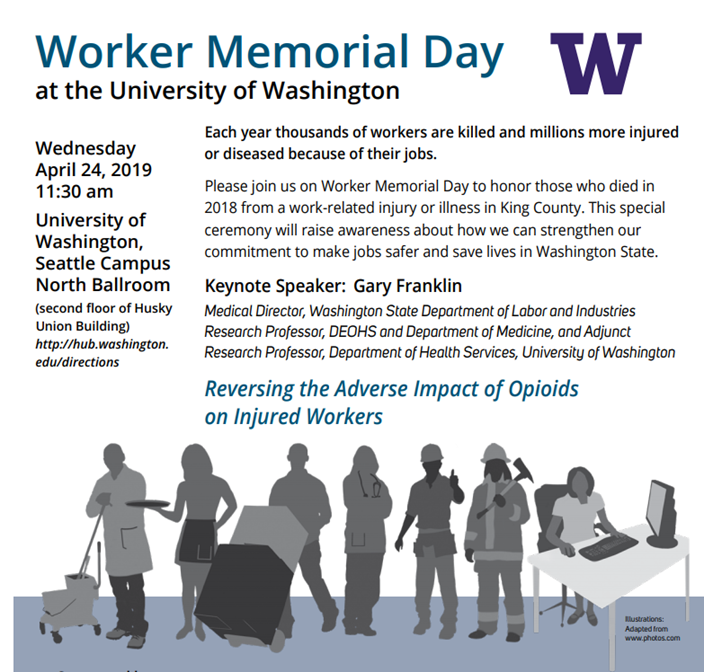 Please join us on Worker Memorial Day to honor those who died in 2018 from a work-related injury or illness in King County. This special ceremony will raise awareness about how we can strengthen our commitment to make jobs safer and save lives in Washington State. A reminder that the FIUTS Student Board application is due tomorrow. We seek a diverse Student Board, with U.S. and international, undergraduate, graduate, and IELP representatives. The application deadline is Wednesday, April 3. We also have a nomination from; if you know of a student with some great potential, please nominate them. This is to help us identify students who may make great Student Board members but need some extra encouragement to apply. Our current Student Board president will reach out to them and share your encouraging words. The Student Board is a great learning environment – a desire to learn is more important than previous leadership experience for these positions! 1. Sign up for Global Fellowships Prep to connect with advisors and gain access to tools to support your fellowship application process. 2. Attend a Global, Gap & Grad Fellowships Information Session to learn about research, study and teaching abroad programs. 4. Join us for a special Schwarzman Scholars presentation on April 17th at 4:00pm in MGH 171. Schwarzman is a fully-funded graduate program at Tsinghua University. Comments Off on Global Fellowships, Fulbright & More! Spring is here and field trips and research is in full swing! So you know, all UW students, staff and faculty can rent gear from the UW Gear Garage. They have lots of gear and special student discounts, for activities like: Backpacking, Camping, Cycling, Events, Parties, Tailgates, Fishing, Mountaineering, and Rock Climbing. Through a partnership with UW’s Population Health initiative, Aga Khan University makes international internships available to UW students. Applications for internships that start in autumn are due April 17th. There are a total of 19 internships available in fields such as research, finance, communications, health management, grant-writing, IT, and structural engineering. One of the 19 internship sites is specifically seeking a UW student. Research Intern – Medicine – Nairobi position. Seeking master’s or PhD student in a field such as public health, global health, epidemiology, social sciences, economics, statistics, and demography. The intern will work with UW professor Michael Chung. Click here to learn more about these opportunities. Please note this additional information from the UW Study Abroad Office & the Office of Global Affairs. UW students selected for these positions must remain enrolled at UW for the duration of their internship. The University is committed to offering a diverse set of international opportunities for students. However, the University reserves the right to cancel or alter, at any time, any international program, internship or activity when, based on a review of the relevant information and resources, it is determined that there is undue risk to the health and safety of students in a particular destination. If accepted into this internship you must maintain your status as a student at the University of Washington for the duration of your placement by enrolling in Independent Learning through UW Study Abroad. The fee for Independent Learning is $350 per quarter which includes registration for up to 12 credits. Questions about the specifics of individual internships should be directed to the AKU Programme Coordinator at aku.iip@aku.edu. 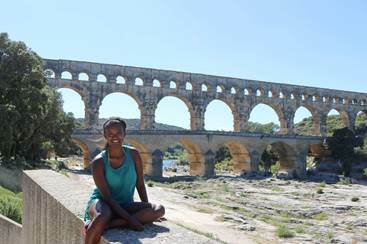 Questions about UW policies and procedures related to international internships should be directed to studyabroad@uw.edu. ESRM 320 will be offered this summer quarter during term A (mid June-mid July). This is an introductory business course designed for non-business majors, has NO prerequisites, and gives NW and I&S credit. ESRM 320, Marketing and Management From a Sustainability Perspective, is an online course (except for a mandatory in-person exam on 7.23). Explain marketing, management, and corporate social responsibility. Describe how markets are segmented, targeted, and products positioned to satisfy individual and business consumers’ needs. Compare techniques for creating value-added products; valuing environmental and social externalities and managing traditional pricing; developing distribution strategies and “greening” the supply chain; and creating and implementing promotion campaigns. Define managerial and leadership styles and theories of motivation. Summarize the human resource process of recruiting, interviewing, hiring, training, motivating, and evaluating employees. Here’s a great opportunity for a graduate student to receive a fellowship working with the University of Washington Press. Christopher Schell (Ph.D., Assistant Professor of Urban Ecology, University of Washington, Tacoma) will be presenting Monday (4/8/19) from 3-4pm in the Physics and Astronomy Tower, Room C520. Reduced fear in wildlife is becoming an extensive phenomenon across the globe. Justifiably so, as a minimum level of habituation may be necessary to survive rapid, human-driven landscape changes. However, fearlessness beyond a certain threshold may increase the potential for human-wildlife conflict. Investigating the mechanisms that underpin human-directed fearlessness may therefore be a significant tool for diagnosing and mitigating conflict before incidents occur, increasing the basic and applied potential of such research endeavors. In this talk, Dr. Schell will detail the potential processes that contribute to the emergence of boldness behaviors in coyotes (Canis latrans), a widespread urban-adapted mammal. The talk will also explore the varied work of the Grit City Carnivore Project, a research collaborative dedicated to uncovering the patterns and processes by which urban carnivores navigate urbanization in the Pacific Northwest. Dr. Chris Schell is an Assistant Professor of Urban Ecology at the University of Washington, Tacoma, and principal investigator of the Grit City Carnivore Project. Dr. Schell’s research integrates evolutionary theory with ecological application to disentangle the processes accentuating human-carnivore conflict. Specifically, his interests lie in understanding the physiological mechanisms and anthropogenic drivers that may contribute to fearless behavior in urban carnivores. His research is uniquely tied to the community: urban ecology is inherently a synergy of anthropogenic forces and natural processes. Hence, he often works closely with nondominant communities (e.g. ethnic and racial minorities), wildlife managers, cultural institutions, and philanthropic organizations to help foster mutually enriching relationships among people and wildlife. Chris received his B.A. in Psychology from Columbia University (2009) and his masters and Ph.D in Evolutionary Biology from the University of Chicago (2015). 2019 Sustaining Our World Lecture (4/11) is just a week away! The 2019 Sustaining Our World Lecture is just about a week away, and we want to see you there! The talk is free and open to the public, and tickets are going fast, so please be sure to RSVP to save your spot. 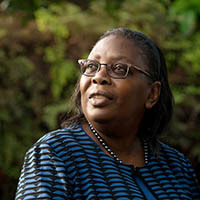 This year, we are pleased to welcome Dorceta Taylor from the University of Michigan’s School for the Environment and Sustainability (SEAS) as our 2019 Sustaining Our World Lecture speaker! When: Thursday, April 11, from 7-8 p.m.
Where: Kane Hall 220The talk is free and open to the public, but seating is limited, so we encourage everyone to register in advance. Please be sure to RSVP to save your spot.We hope you’ll join us for this special opportunity. To request disability accommodation, contact the Disability Services Office at 206-543-6450 (voice), 206-543-6452 (TTY), 206-685-7264 (fax) or dso@uw.edu. The University of Washington makes every effort to honor disability accommodation requests. Requests can be responded to most effectively if received as far in advance of the event as possible, preferably at least 10 days. Comments Off on 2019 Sustaining Our World Lecture (4/11) is just a week away! Announcing The 2nd Annual Resilience and Compassion Initiative Seed Grants! 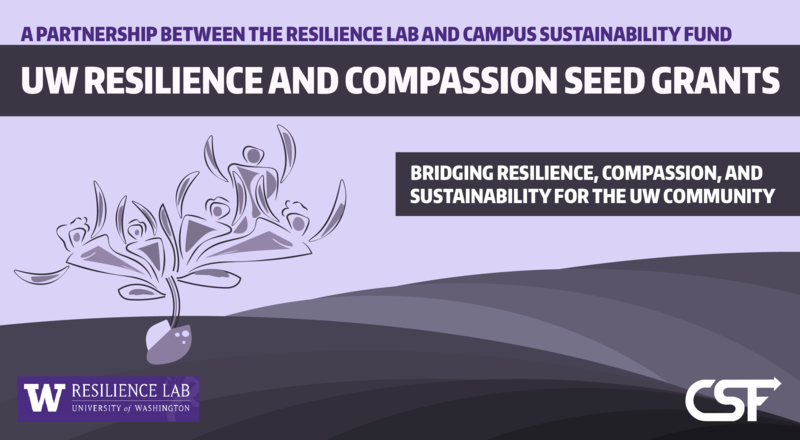 The Campus Sustainability Fund has teamed up with the UW Resilience Lab this year to offer Resilience and Compassion Seed Grants. The focus will be on the interconnectivity between the UN Sustainable Development Goals with a focus on the “Good Health & Well-being” goal as it relates to resilience at UW. The CSF & Resilience Lab recognize that social & cultural resilience and equity are the building blocks of a sustainable environment — and are excited to offer focused funding resources this year to help catalyze projects in this area. What would compassion-in-action look like to you? How might you center themes of diversity, equity and inclusion in addressing social sustainability & resilience at UW? Supporting activities, programming, applied research, and/or projects that build connection, community, and advance UW’s Declaration on University Global Engagement toward the UN’s Sustainable Development Goals. Current UW faculty, staff and students are eligible to apply. Applications will be accepted from April 1 – April 30, 2019. Award amounts will range from $500 to $3,000. Please spread the word about this exciting opportunity by sharing this message with your colleagues and classmates! The Evans School is accepting applications for the International Development and Nonprofit Management Certificate programs. All current UW graduate students from any campus are welcome to apply, as long as they will be enrolled for the duration of the 2019-20 academic year. The application deadline for both programs is Friday, April 14, 2019. The International Development Policy and Management Certificate program (IDCP) offers students a foundation for addressing complex questions of poverty and development. The certificate requires that students complete 9 credits of core course material and two electives that cover areas or methods focused on international development. The program handout is attached. The Nonprofit Management Certificate program (NMCP) gives students the tools and framework needed to meet the increasing challenges facing the nonprofit sector today. The program provides students with fundamental knowledge of the nonprofit sector through one core course and four elective courses. The program handout is attached. Wildlands Studies info session on April 18, in Anderson 22.